A supervisor must be organized and efficient. A theme park supervisor is a necessary part of the management hierarchy of a well run park, but there are many different levels of supervision that are needed to fulfill all the essential duties to keep a park running smoothly. Single Location Supervisor: This individual is responsible for one location within the park, either a food stand, gift shop, ride, or other attraction. Generally they have worked the same or similar locations as regular employees, and as a supervisor they are now responsible for ensuring that the daily operations of the location proceed smoothly. This may include opening or closing the location, filling out daily checklist and inspection paperwork, training new employees at that location, overseeing employees' breaks, making weekly schedules, conducting inventory, and other tasks related to their one work location. Area or Region Supervisors: These management employees oversee a set of related locations, generally within the same department such as several gift shops or rides that are in close proximity to one another. Their tasks include approving the paperwork the single location supervisors have completed, making suggestions for improvements in efficiency and service, dealing with employee discipline, handling emergencies, and coordinating larger programs that will affect several locations. Depending on the size of the theme park, there may be several region supervisors in each department to cover the entire park, and lower level region supervisors may themselves be overseen by another, higher level of area theme park supervisor. Full Park Supervisors: These upper level management supervisors generally oversee all of a single department within the park. They will manage the area supervisors, including making their schedules, approving orders, dealing with employee discipline up to and including termination, recruiting new employees, and making year-round decisions such as removing old attractions and suggesting new ones. This type of position is generally a full time, year round position even for parks that may be open to the public only for a few months. General Manager: This individual oversees the department managers for the entire park and is generally the most important and most influential supervisor. While they are usually familiar with all the daily operations of the park, their duties are more far-reaching and include dealing with media representatives, overseeing full park management operations, making construction decisions, and other significant actions. For many parks, this manager is often overseen by a directorial board or other multi-member committee, though the park manager will implement the committee's decisions on a day to day basis. Every park attraction needs a supervisor. 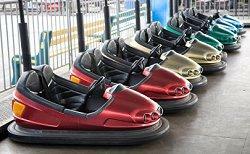 Rides: Large and small attractions, roller coasters, water rides, etc. Admissions and Reservations: Ticket sales, hotel reservations if applicable, group sales, etc. Being a theme park supervisor can be a challenging yet rewarding job leading to a career in park management. Becoming a supervisor, however, takes dedication and experience. Most supervisors begin as regular employees but through hard work, good records, and outstanding service they may be promoted to higher supervisory positions. While it is possible to go from being a regular employee to a single location supervisor in just a few months, particularly at seasonal parks, it is more likely that supervisors have worked at the park for more than one year before they are promoted to any type of management position. Achieving higher levels in the management hierarchy may take several years of experience as well as related higher education degrees. For some parks, interested individuals may indicate their desire to be supervisors on the initial application. Demonstrating leadership experience, teamwork and management skills, and a willingness to go above and beyond standard duties are all useful traits that can lead to promotions, particularly to lower level supervisor positions. Many employees dream of becoming supervisors so they can have more control over their work environment, but it is not a job that should be undertaken lightly. Supervisors often work 70 hours or more each week and are responsible for more challenging tasks than regular employees. There generally are pay increases for higher levels of supervision, however, and some parks may offer additional benefits such as paid time off, health care, and retirement packages for full time managers and supervisors. A theme park supervisor is an essential employee for any park, and most parks employ dozens of supervisors at different levels and in different departments to ensure the park's day to day operations proceed smoothly. Without that coordinated management, a guest's theme park getaway would not be as enjoyable or fun, and the various supervisors are essential for a well run park.